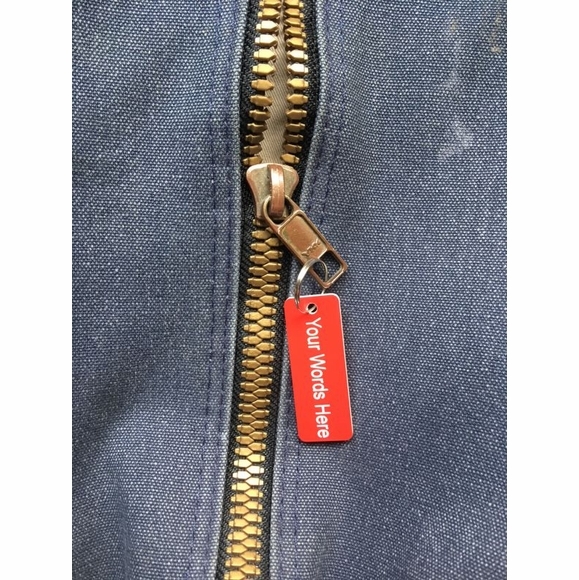 Jacket Tag - - engraved with your custom message. Personalize your jacket tag with whatever you wish to say. Display your name, today's trendy saying, #hashtag, instagram user name, city, ham call sign, boat name, slogan, quote, dog or cat name, favorite sports team name, group name, band etc. Attaches to your jacket zipper with included stainless steel 3/4" split key ring. Colors: sky blue with white characters; black with white characters; white with black characters; brushed gold with black characters; brushed stainless with black characters; evergreen with white characters; red with white characters; yellow with black characters; brown with white characters; and wood tone with white characters; beige with brown characters; and pink with white characters. Comfort House # J0083 by Shayla's Tags.